Based on manga series "Sensei Kunshu" by Momoko Koda (published from July 13, 2013 to June 13, 2017 in shojo manga magazine Bessatsu Margaret). Filming begins January 15, 2018. Theme song for "Sensei Kunshu" is a cover of The Jackson 5's "I Want You Back" by Kpop girl group Twice. Gain Mar 16 2019 12:35 am Anyone can find yuki yamada as the cameo? Can you guys tell me where? The keiko kitagawa's one was hilarious ? Ee ma Mar 02 2019 7:55 am Twice Twice Twice Twice Twice kyaaa Twice.the heroine sounds really cute and i loved the trailers.i'll watch this for sure. Ozz Feb 24 2019 12:10 am Mantul !! niahana Nov 20 2018 6:55 pm Minami Hamabe and Ryoma!??? Definitely fav!!! JokerAceX Aug 07 2018 4:46 pm Nice to Kamen Rider actors finding success outside of the action shows. This looks adorable, might have to give it a shot. Gelo Bongs Jun 28 2018 12:18 pm Holy Moly!!! Minami Hamabe (Menma from AnoHana live action) and TWICE in one movie!!!!!!!!!!!!!!!!!!!!!!!!!!!!!!!!!!! 11/10 already. Yunisauthentic Jun 16 2018 8:33 am I can't wait to watch this! My heart beats so fast! Wahhhh my beloved Twice! ? Dany Jun 16 2018 6:22 am "I want you back" from TWICE OMG !!! dahyunismismyreligion Jun 14 2018 10:33 am ost is awesome , looking forward to watch this! Hellloo May 29 2018 6:20 pm Twice will be singing the main ost for this movie!!?? Koko Apr 27 2018 4:08 am Anyone knows what the title of song in the teaser? poster Apr 26 2018 7:41 am I will watch this just for Minami. She was absolutely stunning in Kimi ni suizo wo tabetai. Hannah Loyl Mar 14 2018 11:08 am What?!!!! They have live action?!!! O. M. G.
Mii Feb 02 2018 4:24 am @spideylife yes, please!! 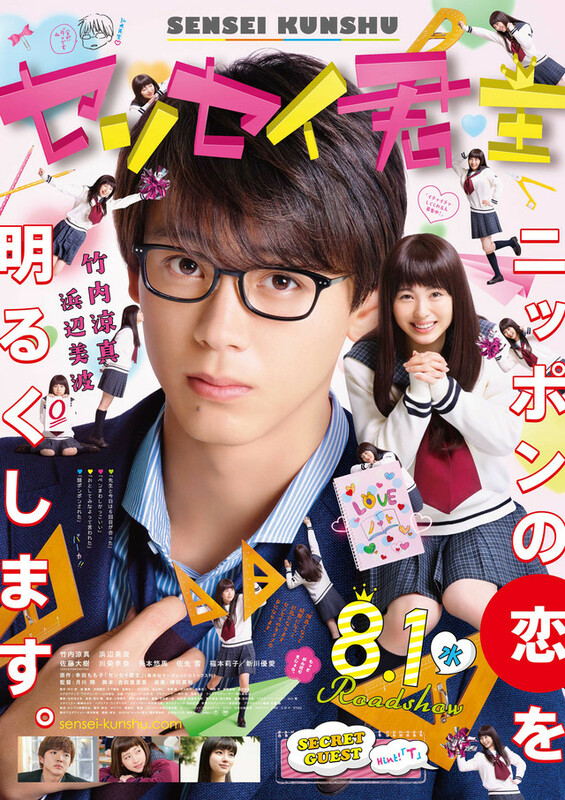 if they'll follow the manga, the younger brother's (Kentaro) role should really appear! kyaaaah!! Itorin Jan 18 2018 2:28 pm Really can't wait to watch it! So excited to see Minami plays the heroine again after "Kimi no Suizo wo Tabetai". But i really have to wait for another year it seems, must endure it!! irizjoi Jan 16 2018 10:22 pm So excited for this!!!! Btob Jan 08 2018 5:20 am OK... The main cast is wonderful! I want to watch it right now!!!! Ryoma-kun Jan 08 2018 4:05 am OHMYYYYY!!!!! Ryoma as a sensei (okay, okay, don't panic) waaaah! i'm so excited for this! Kyaaaaaah!!! Ryoma!! Suki desu!